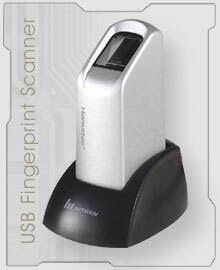 * Please visit our new website http://fingerprint-scanner.bioenabletech.com for complete range of fingerprint scanners. USB Fingerprint Scanner is a device for computer Security featuring superior performance, accuracy, durability based on unique NITGEN Fingerprint Biometric Technology. USB Fingerprint Scanner can be plugged into a computer separately with your mouse. USB Fingerprint Scanner is very safe and convenient device for security instead of password that is vulnerable to fraud and is hard to remember. Use USB Fingerprint Scanner with your choice of compatible biometric software for authentication, identification and verification functions that let your fingerprints act like digital passwords that cannot be lost, forgotten or stolen. Personal computer / workstation security. Fast and Perfect Authentication through excellent Algorithm. High-performance, maintenance-free optical fingerprint scanner. Resistance to scratches, impact, vibration and electrostatic shock. Latent print image removal (does not accept prints left behind). :: Visual Basic OCX evaluation SDK. USB fingerprint scanner in news: Check here for USB Fingerprint scanner news in Express Computer.